Huffington Post, November 5, 2014 -- Can you hear me now? Good! Hopefully that means there isn't a spider living in one of your ears. 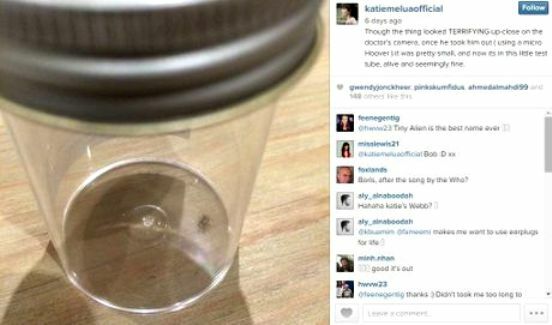 Melua, 30, believes the spider crawled into her ear canal when she used some old in-ear monitors to "block out sound on a flight," according to an Instagram post. The spider set up residence for a full seven days. But other than the "occasional shuffling noises," the pop star told her fans, "it was no hassle at all." Ear canals actually serve as pretty comfy homes for critters, says Philip Koehler, Ph.D., an entomology professor at the University of Florida. Koehler told HuffPost that insects -- or, in this case, arachnids -- "are probably entering the canal as harborage, for heat, and/or for moisture." 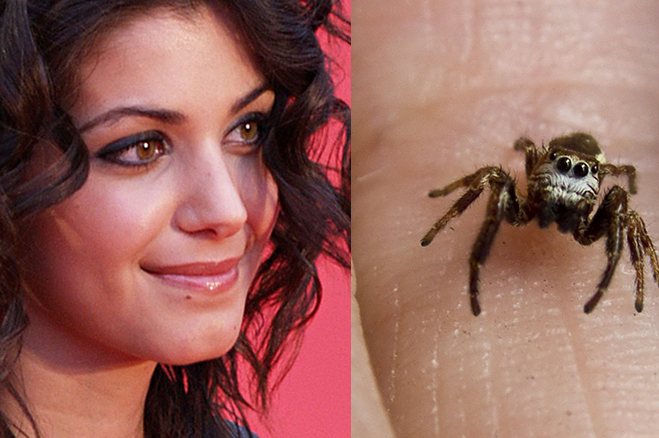 Melua's spokeswoman told MSN that the singer released the spider in her garden, where hopefully there's more to eat. Do bugs crawl in people's ears? Yes, they do. Before you launch into a full-scale panic attack (and my apologies if you already did), you should know that it doesn't occur very often. And although a bug crawling around inside your ear canal can be very uncomfortable, it isn't (disclaimer: usually) life threatening. Now, if you happen to have a lot of cockroaches in your home, you might want to sleep with earplugs in, just to be on the safe side. Cockroaches crawl into people's ears more often than any other bug, according to one admittedly small study conducted from 2001-2003 (PDF). Doctors in one hospital were asked to preserve any arthropods they removed from patients' ears over this two-year period. Of the 24 bugs they extracted from people's ear canals, 10 were German cockroaches. They aren't crawling in ears with ill intent, though; they're simply looking for a cozy place to retreat. Cockroaches exhibit positive thigmotaxis, meaning they like to squeeze into small spaces. Since they also prefer to explore in the dark of night, they can and do find their way into the ears of sleeping humans from time-to-time. "You've got maggots in your ear"
Coming in a close second in the arthropods-in-ears study were flies. Doctors plucked 7 house flies and one flesh fly from various people's ears. Almost everyone has swatted away an annoying, buzzing fly at some point in their lives, and thought nothing of it. But one unfortunate woman from the UK suffered perhaps the most horrifying incident of aural bug invasion I've ever read. According to the Daily Mail online, Rochelle Harris traveled to Peru, where she recalls having hiked through a swarm of flies and swatted them away from her ear. She didn't give the fly encounter another thought. But soon after, she began experiencing terrible facial pain, and she reported hearing scratching sounds coming from within her head. When fluid leaked from her ear, she went to the emergency room. Doctors were initially puzzled, but a thorough exam by an ENT revealed the problem. A screwworm fly had burrowed into her ear and deposited eggs, which had subsequently hatched. Her head was host to what doctors described as a "writhing mass of maggots." Screwworm maggots are not the bugs you want boarding inside your ear canal, I can tell you that much. These parasitic larvae feed on the flesh of their animal (or human) host, and posed a considerable danger to this unlucky woman. Thankfully, her physicians skillfully removed the maggots before they could chew on a facial nerve or make headway into her brain. Rochelle Harris has recovered completely, and her story was featured in a Discovery Channel documentary called Bugs, Bites and Parasites. Rochelle's ordeal was quite unusual, it should be noted. Most cases of bugs-in-ears are nowhere near as dramatic or dangerous. 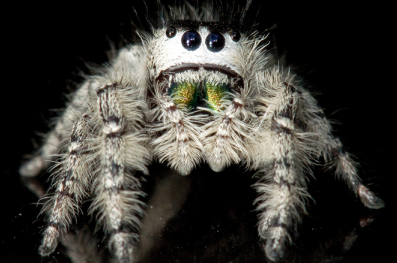 Doctors in China coaxed a jumping spider out of a woman's ear without incident, and a Swiss man found his persistent tinnitus was resolved once doctors pulled a tick from his eardrum. A young boy in Colorado got a keepsake from his trip to the ER. Doctors put the miller moth that had been fluttering around in his ear in a specimen cup, presumably to serve as the best show-and-tell item ever. Oddly, one bug that tends not to crawl into people's ears is the earwig, which was so nicknamed because people thought it did. Andy Deans of the North Carolina State University Insect Museum emphasized this fact by playing a convincing April Fools' joke on his readers a few years ago. Any arthropod in your ear is a medical concern, because it can scratch or puncture your eardrum or potentially cause an infection. Even if you succeed in removing the critter, it's wise to follow-up with a visit to the doctor, to be sure your ear canal is free from any bug bits or damage that might cause problems later. DO NOT let the person put a finger in the ear, since this may make the insect sting. If this doesn't work, try pouring mineral oil, olive oil, or baby oil into the ear. As you pour the oil, pull the ear lobe gently backward and upward for an adult, or backward and downward for a child. The insect should suffocate and may float out in the oil. AVOID using oil to remove any object other than an insect, since oil can cause other kinds of objects to swell.